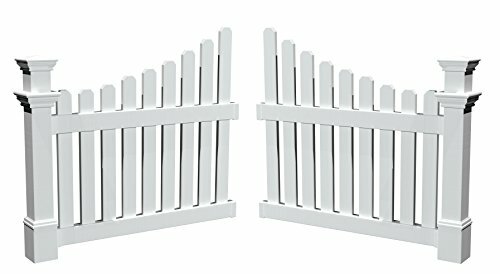 The New England Arbors Two 4-ft. Cottage Picket Vinyl Arbor Wings are designed for the Ashbury and Nantucket II arbors. Side wings allow you to create a grand entryway to your home or garden. They add distinction and privacy to your landscaping. Made from premium hi-grade vinyl, these side wings are durable and maintenance free. This material will not fade over time and never needs painting. A 20 year manufacturers warranty guarantees this product, just like the arbor itself. Assembly is required for this set of 2 wings. Includes detailed, illustrated instructions and all necessary hardware. This product also features in ground allowance. Arbor and gate not included. Available in white. Ships in 1 box. Each wing measures 49 inches wide. A About New England Arbors The world's leading manufacturer of premium vinyl arbor kits, New England Arbors was founded in a simple barn in the late 1990's. There the founders began replicating the beauty of New England design with simple, low-maintenance vinyl materials. The business has grown since then, now supplying arbors, pergolas, and trellises all over America and beyond. With headquarters in Port Huron, Mich., and Sarnia, Ontario in Canada, New England Arbors is dedicated to the creation of the most attractive and durable vinyl arbors possible. Weatherproof, no-maintenance vinyl material. UV-treated to resist fading. Includes 2 wing sections. 20-year warranty. Some basic assembly required. Detailed instructions and all hardware included. Each wing dimensions: 49W x 5D x 44H inches. For use with Ashbury and Nantucket II Arbors. Pergola Arbors Ideal for Garden a Wedding Entry-way or Indoor Weddings. This Decorative Weather Resistant Pergola Kit Will Enhance Any Garden Setting with the Trellis for Plants and Visual Appeal. The Missing Piece to Create an Enchanting Oasis.